Focus on Malawi is an informal group of UK-based volunteers, medical and lay, working in association with The Raven Trust. The group’s objective is to support the development of self-sustaining eye care services at Ekwendeni and Livingstonia hospitals in northern Malawi. Until recently, healthcare in these hospitals has prioritised maternity services, nutrition, health education, medical and emergency services. Eyecare has been low on the agenda. Eye problems exist, of course, but with additional needs owing to: climate, malnutrition, tropical diseases, and a lack of understanding about the care of even minor ophthalmic injuries. As anywhere else, however, about half of the sight needs are presbyopia (long-sightedness), so a large proportion of the problem can be solved with simple reading glasses. And this is where Focus on Malawi started, on its first visit in 2005, dispensing second-hand glasses sent by well-wishers in the UK and USA. Subsequently, two eye clinic buildings (at Livingstonia and Ekwendeni mission hospitals) have been completed and equipped through the hard work of The Raven Trust, and with the support of generous donors around the UK. The ongoing challenge is to find, train and retain local staff to provide a permanent, sustainable service. 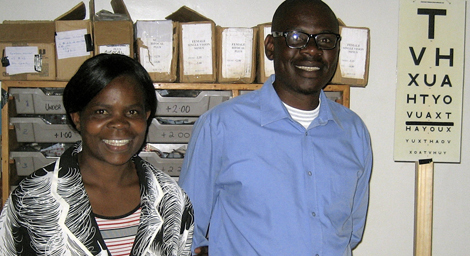 We sponsored the training of our first ophthalmic clinical officer, who ran the Livingstonia clinic for two years (but who unfortunately is now moving away from the area). However, there is some good news: an even better qualified person has recently arrived at the hospital, and he is likely to be able to expand the service significantly. In the meantime, there are two members of hospital staff at Ekwendeni Hospital (see pic), dispensing reading glasses. They charge a small fee to patients and the income helps to offset the clinic’s costs. Recent developments in internet access in East Africa have helped us improve liaison with staff and management. Teams from the UK visit every year or so, to monitor progress and to conduct clinics. These teams consist of volunteer optometrists, orthoptists and ophthalmologists (who pay for the cost of their travel and lodging). In addition to hospital work, we also visit a blind school to assess the children and help support the needs there. Back home, we collect second-hand glasses, sort and measure them and send them out to Malawi. The Raven Trust provides a secure shipping service for our glasses and equipment and, when we visit, they kindly arrange our transport and accommodation. When we’re not there they keep an eye on how the work is going. 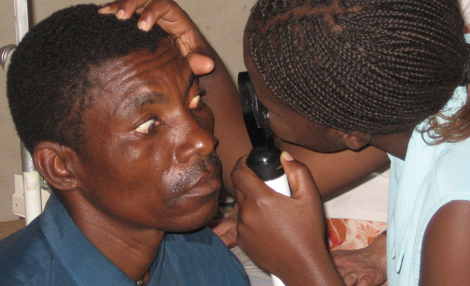 Focus on Malawi is organised by Sue Kevan (orthoptist) and Dr Caroline Sheldrick (ophthalmologist). For contact details, more info and news, please visit the the Focus on Malawi blog.